Messes are a part of life. 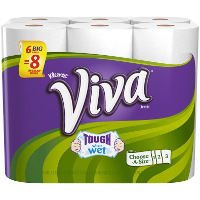 Soak 'em up with VIVA towels - soft & strong like cloth. With VIVA Paper Towels, you can spend your time enjoying life's surprises. Treat your family to a great paper towel. VIVA - the answer to life's little messes. Absolute best. Would not but any other than Viva! Wonderful product. Only paper towels I buy. I believe this is the best paper towel on the market and has been for a long time. It does not come apart, is very absorbent and so much like cloth to use I can scarcely tell the different. Leaves no link after cleaning, I like much and buy all the time even if it is the highest priced. Thanks for keeping the product so good.